Virgin Media Broadband Down, Catastrophic UK Wide Failure! Up until a month ago you would have found me singing the praises of Virgin Media broadband for being by far the fastest and most reliable service providers out there, definitely many times better than the garbage service offered by BT and those that rely on the BT network. But unfortunately over the past month the reliability of Virgin Media's broadband service has been diminishing in reliability. It started off with being down for a couple of hours every other day to becoming a near daily occurrence that come around 4pm to 5pm the network would go down for a few hours. However, starting around 4pm on Wednesday the 18th of October the network went down and has stayed down ever since for well over 8 hours as of writing. Initially a check on the virgin media status page showed that the service should be fixed within a couple of hours by about 7pm. However, 7pm came and went with the status page updated with a new estimated fix of 10pm. So 10pm came and went with again the estimated fix being extended to 12.30am. And so now at 12.30am has come and gone with no fix in place, which implies another revised estimate should be appearing, unfortunately all the status page now show is an "Oops we're sorry" message! 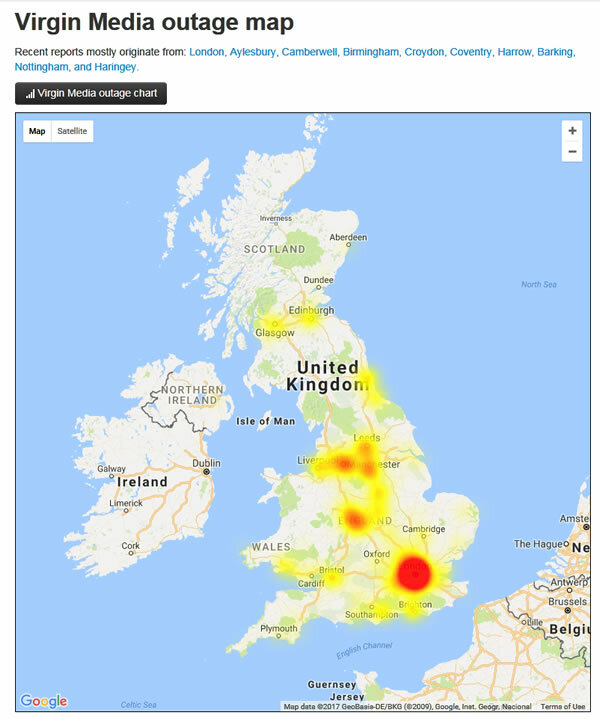 Furthermore the following UK map illustrates the magnitude of the broadband outage that Virgin Media is currently experiencing, as it appears to be catastrophic failure across virtually the whole of Virgin Media's national broadband network. So unlike the usual pockets of outages, today's outage appears total and may not bode well for future usage of a virgin media services that until a month ago had proved very reliable, but clearly something is going very seriously wrong at Virgin Media which could be related to overselling of the cable broadband services coupled with a breakdown of its installed infrastructure. Anyway, it appears to be approaching the time when I will have to start searching fro a reliable alternative to Virgin Media, because broadband being down for well over 8 hours so far is totally unacceptable, as is the perpetual failure to fix the network which will likely continue to be outwardly revised on the virgin media status page. Virgin Hub does not allow 3rd party DNS servers. There is a work around by putting the up into modem mode and plugging in another wifi router.